These minimalist compact vanity units are ideal for where space is tight such as cloakrooms, en-suites or smaller bathrooms. The sleek designs will keep things practical for daily use. Each of these compact vanity units features a stylish, understated look that will complement any modern bathroom. The simplistic, single tap hole design of these fixtures will bring things right up to date. 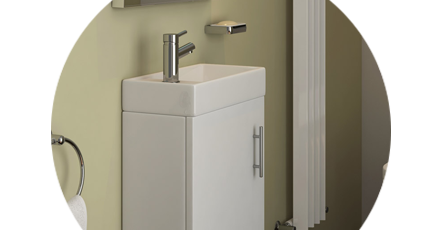 Our vanity units come in a range of sleek, contemporary wooden finishes including gloss white, ebony and light oak. These colours will all work well in modern homes, giving you a look that's on-trend.